PC version features high resolution textures, tessellation, high quality shadows and more PC-specific features. Can be run without the Steam client by passing the -uplay_steam_mode command line argument to the main executable. All versions require Uplay DRM. The Deluxe Edition is a complete edition containing the base game and all DLC. GamerProfile.xml contains User profile settings. InputUserActionMap.xml contains keybindings and input settings. 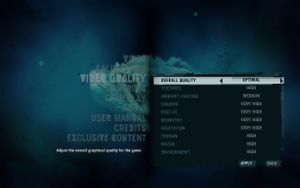 Far Cry 3 has a maximum of 3 player profiles. Each player profile contains 1 automatic autosave, and 1 manual save that can be used to bookmark the current checkpoint. Save games automatically sync (broken when running in Wine). See Widescreen resolution to set a custom resolution. Use Flawless Widescreen to fix FOV and HUD. Between 55° and 110°; use Flawless Widescreen for higher settings. Set in options or toggle with Alt+↵ Enter. Set with "window mode" in-game. Up to 8x MSAA, Post FX handles FXAA. Aliasing may appear when using MSAA with SSAO. Uncapped. See Frame rate limit to cap fps. This is the best method to eliminate microstuttering - especially with the DX11 executable. This method is better than adding the command in GamerProfile.xml because you won't have to set the properties to 'read only', so you can change this parameter without having to lock graphics settings or gameplay settings. Go to the configuration file(s) location. Open GamerProfile.xml with a text editor. Change ResolutionX= and ResolutionY= to the desired values. Whenever you change graphical settings in-game ResolutionX= and ResolutionY= will be reset to 800x600. This only disables depth of field on background and when not aiming. This enhances antialiasing on forests and objects that are near, stabilizes the frame rate fluctuation, fixes the low-res textures on the background and can give a huge FPS boost in open view areas, for example, on the top of a tower. Before doing anything, set PostFx in-game settings to low and save. Locate PostFxQuality="x" and change x to false. Find Hdr="x" and change x to 0. Ambient occlusion can't be disabled completely through the in-game settings when playing in DirectX 11, only switched to various techniques available (SSAO, HBAO, HDAO). Locate SSAOLevel="x" and change x to 0. Whenever you change graphical settings in-game SSAOLevel="0" is changed back to the default 1 (SSAO). Disabling also helps to reduce input lag. Even if motion blur is handled by PostFX setting, completely disabling PostFX doesn't seem to work. It can be disabled with <post> in configuration file but game seems to remove it with every launch. Go to the configuration file location. Save the file and make it read only. Making the file read only prevents game from changing any settings so make sure other settings are OK before doing this. Certain vehicle controls not rebindable. To bind ↵ Enter, see Bind Enter key. Scroll wheel is hard-coded to switch grenade type. If you rebind it, it will perform both actions at once. Positive acceleration, see Negative mouse acceleration to disable. 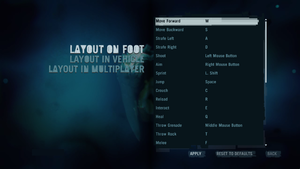 Mouse cannot be used in menus if a controller is used. Used by both the mouse and the controller. There is a prompt to switch to controller for one time that cannot be confirmed with a controller. After that, all menus can be used with a controller. 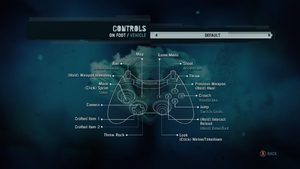 No mixed controller and keyboard controls for vehicle sections. Open InputUserActionMap.xml with a text editor. The hex codes are CRC32B hashes of key names. The first half corresponds to either "kb" (0x646CA0E7) or "mouse" (0xAF35B6ED). The second half is the name of the key or button. To bind Keypad Enter, replace 0xA79E3F0F ("return") with 0x949D9DA2 ("numpadreturn") in the example above. To bind Keypad Dot/Comma, replace 0xA79E3F0F ("return") with 0x5AFDB393 ("decimal") in the example above. Negative mouse acceleration prevents fast mouse movements. Mouse acceleration option in the Options menu does not fix the negative effect. Right click on Common.fat and select Open with. Select browse, then go into the "bin" folder you just extracted and select Gibbed.Dunia2.Unpack.EXE. Open the newly created Common_Unpack folder and go into the actionmaps folder. Open Inputactionmapcommon.xml with a text editor. Find and replace all instances of maxOutput="10" with maxOutput="999999". Go back to Data_win32 folder. Now open another Window and head over to the bin folder. Drag the common_Unpack folder and place it onto Gibbed.Dunia2.Pack.EXE. Rename Common_Unpack.dat and Common_Unpack.fat to Common.dat and Common.fat respectively. Not included despite being advertised. Only available on consoles. Universal Plug and Play (UPnP) support status is unknown. 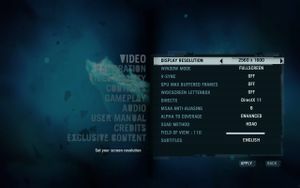 See FarCry3 (DX9 only) - 3D Vision fix for better support. Crashes can randomly happen in all parts of the game. Crashes are more frequent after first -unskippable- cutscene. Changing from DirectX 11 to 9 in the video settings may solve this problem. Artifact blocks appear on screen. Escaping to menu and returning and geometry has failed to load correctly. Stretched, hollow blocks of the ground appearing randomly. Sometimes fixed by changing to DirectX 9 or going offline in Uplay. 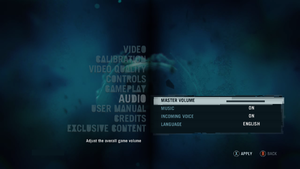 For some reason Far Cry 3 will sometimes have a (poorly) translated interface. These forms of V-Sync can reduce micro-stuttering. For Nvidia cards, Adaptive V-Sync can be enabled through the driver control panel. Set 'Vertical sync' to Adaptive. For Nvidia cards and G-Sync monitors, a 60 fps cap in Nvidia Inspector or RTSS will greatly reduce micro-stuttering (if not all of it), only as long as the framerate doesn't drop below 60. GPU Max Buffer Frames set to anything but Off can also help. For AMD cards, Dynamic V-Sync can be enabled using the third-party program RadeonPro. 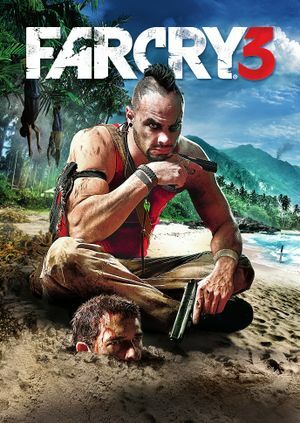 Click the Add new profile icon and find the Far Cry 3 executable (farcry3_d3d11.exe or farcry3.exe). Click the newly created profile and click the Tweaks tab. Set 'VSync Control' to Always on. Enable 'Dynamic Framerate Control' and set 'Keep up to' to 60. For Windows 8.1 users, toggle off the core with max usage in the CPU affinity settings. For Core i7 CPUs, toggle the hijacking core and its corresponding logical thread. If your game freezes and crashes when entering a saved game, you must disable the Post FX option. Enter the game and enter the Options menu. Enter the Video Quality menu. Set all parameters to your personal preference. Game splash screen pops up on desktop and freezes, doing nothing until the process is ended. Game reports wrong button for opening parachute when jumping with wing-suit. There seems to be a link between the Crouch and Switch seat keybindings. Make sure that these actions are bound to the same key. Weapons earn EXP and level up during matches, but do no retain EXP post-game; weapons stay at level 1 indefinitely. Go to %PROGRAMDATA%\ and make a folder called Orbit (if it does not already exist). Make sure Orbit is set to hidden (right-click, Properties, Hidden). Paste folder 46 into Orbit. When using a C:\ drive with limited space such as an SSD, the game will not install onto a secondary drive even if you have sufficient free space. Prepare new folder for temp files in different drive. From Advanced tab click Environment Variables button. In user variable list, change both TEMP and TMP to newly created folder. Save changes and restart computer. To access enviroment variables more quickly, simply search for Enviroment variables with Windows search. Once the loading screen comes up, press Ctrl+Alt+Del to open the Task Manager. Click processes and make sure "show all processes" is selected at the bottom of the screen. Find WmiPrvSE.exe, right click it, end procress. The loading screen should end shortly afterwards. The Game will refuse to run when installed on a drive which is managed by a Windows 8/8.1 Storage Space. Press Ctrl+⇧ Shift+Esc to open the Task Manager. Find TabletInputService (Touch Keyboard and Handwriting Panel Service). Launch the game in Win8 or Win7 compatibility mode. ↑ 1.0 1.1 File/folder structure within this directory reflects the path(s) listed for Windows and/or Steam game data (use Wine regedit to access Windows registry paths). Games with Steam Cloud support may store data in ~/.steam/steam/userdata/<user-id>/220240/ in addition to or instead of this directory. The app ID (220240) may differ in some cases. Treat backslashes as forward slashes. See the glossary page for details. ↑ Ubisoft Forums :: Steam and Uplay, possible way to start with just Uplay? 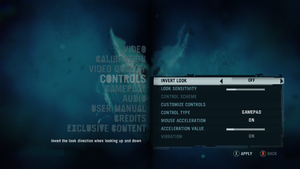 ↑ 4.0 4.1 Far Cry 3 : Screenshot Comparison, most noticeable antialiasing is in the books at the corner. This page was last edited on 23 April 2019, at 03:24.